When we think of a fun evening with friends or family, the first thing that comes to our mind is a helping of chaat at our favourite roadside joint. The clanging sound of the ladle as the vendor mixes the chole, the sizzling sound of the oil in which yummy tikkis are bring fried, the aroma of chopped onions, coriander and spice powders, and the zesty flair with which the vendor mixes and serves the chaat, all this and more makes chaat an experience to savour rather than a mere foodstuff! Interestingly, every region has its varieties and variants of chaat based on the seasonal produce, regional specialties, etc. Everybody loves chaat and with good reason. There is endless variety, all of them being super tasty. Plus, you can make your chaat dinner as light or as filling as you want to. A few Paani Puris served at the beginning of a meal can be a starter while a wholesome Pav Bhaji can be a meal itself! Chaat is totally customizable. You can make it just like you want it to be – you can tweak the ingredients used, the level of spiciness, and everything else. If you want it without onions and garlic, no issues, it still tastes awesome! The best part is that you can make chaat right at home in your own kitchen. You can just make chaat for dinner on any day, or even mix-and-match a couple of chaats and make it the theme for your next party. 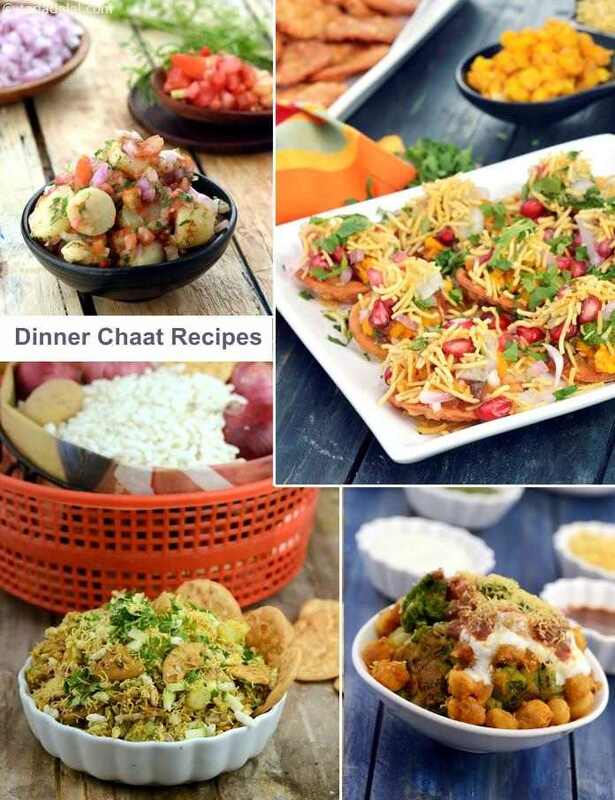 Here is a selection of some of our favourite chaat recipes for dinner! You can go for common but evergreen favourites like Bhel Puri, Chole Samosa Chaat or Pani Puri. Tikki-based chaats are always a flyaway success, because they are filling, tasty and simply too luxuriant for words. Have a go at the Aloo Tikki Chaat, Stuffed Aloo Tikki Chaat or Chole Tikki Chaat. Alternatively, you can give regional specialties a try. The Mini Dal Pakwan Chaat, Khasta Kachori Chaat, Stuffed Ragda Patties and Pakodi Chaat are gems worth your effort! No day is too busy for chaat! Try making your favourite chaats in your own kitchen. You will be surprised to see that making the chaat will be a very relaxing pastime, even after a stressful day. Visualize the end product at every stage, bring in your own ideas, and create a masterpiece that will plant smiles on your loved ones’ faces! Enjoy our Chaat recipes for Dinner. Given below are more Dinner Recipe articles.